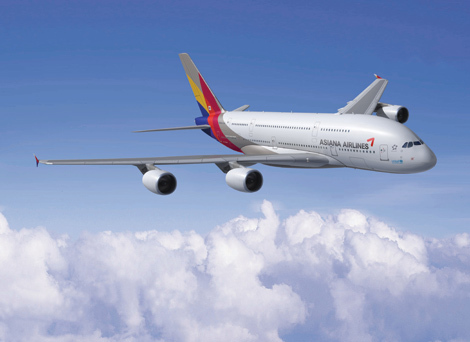 Asiana Airlines will fly its new A380 on its Tokyo and Hong Kong routes from June 13. The Seoul-based carrier’s Osaka and Bangkok services will be serviced by an A380 from July 24, while Los Angeles flights will follow on August 15. The 495-seat A380’s main deck includes 12 first class seats arranged in a 1-2-1 configuration, with 83 inches of seating space, 80-inch bed, and a 32-inch monitor. There are also 311 economy seats configured 3-4-3, with 33 inches of seating space and an 11-inch monitor on the main deck. The upper deck has 66 business seats in a 1-2-1 configuration with 80.4 inch seating space and 74.5-inch bed, and a 15.6-inch monitor, plus 106 economy seats arranged in 2-4-2.